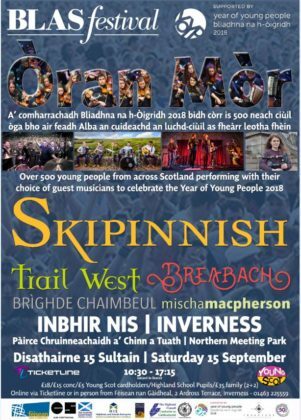 On SATURDAY 15th SEPTEMBER, BLAS FESTIVAL 2018 https://www.blas-festival.com closes with a special event at the NORTHERN MEETING PARK, INVERNESS. This daytime event is to celebrate THE YEAR OF YOUNG PEOPLE (YoYP) and is the only large-scale event to take place as part of YoYP within the north of Scotland. Fèisean nan Gàidheal with support from EventScotland is hosting the all-day concert and we would like to ensure that news of this reaches all Highland schoolchildren and their families as well as the general public. This is intended as a family-friendly event with bands chosen by a panel of young people. Tickets cost £18, £15 and ONLY £5 for all school age young people and those under 26 carrying a Young Scot Card. Bands include Trail West, Breabach and Skipinnish and these musicians will take to the stage alongside young musicians from throughout Scotland. We think the day is lining up to be a very exciting event.